You are here: Home / Natural Fine Planetary Talismans / Imperial Pigeon Blood Red Color Tanzania Ruby, the royal colored Ruby for the Royal Planet – Sun! Imperial Pigeon Blood Red Color Tanzania Ruby, the royal colored Ruby for the Royal Planet – Sun! Comments Royalty, Splendour, Warmth and Vitality reflecting from this fully natural and unheated Tanzania Ruby! Its Imperial Pigeon Blood Purplish Red color radiates through its perfectly oval cut! With the brilliance of the Sun itself, this Natural Ruby has the potent and Sattvik powers of the Sun too! 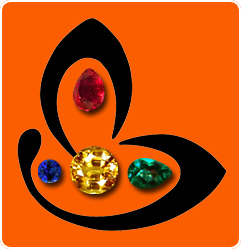 Will deliver the best jyotish results of the planet of power and royalty – Sun! 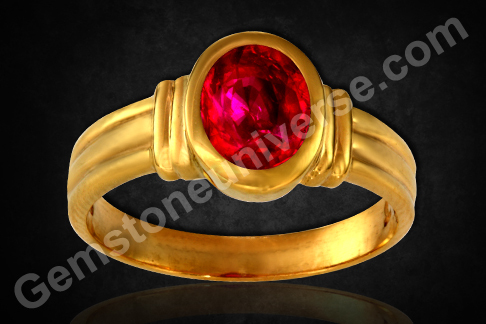 A powerful gemstone set in a 22k Gold ring and making a powerful Surya / Sun talisman!